Ideal size for carrying all of your equipment, apparel and supplies, with room to spare. Sizzling 1260 ripstop honeycomb nylon is flashy but solid. Four extra-large zippered pockets are ideal for all training and travel needs. Full length C-shape top opening, two full size end wet/dry pockets, front center pocket, a water bottle pocket and a side holster for a bevy of options. 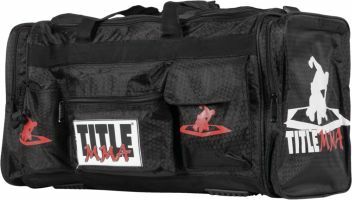 Complete with padded hook-and-loop seatbelt nylon carry handles with fully adjustable and detachable padded shoulder strap. Free water bottle included. Size: 26" X 10" X 12"